TALK OF NIKE INC. taking a hit from the company’s decision to put ex–NFL player Colin Kaepernick at the center of its latest “Just Do It” campaign is looking overblown, based on data from a Silicon Valley digital commerce research company. Nike’s stock has also held up after its initial slump. The stock was up 1% on Friday and remains in the black for the month. It has gained 29% in 2018, while the Dow Jones Industrial Average, which, since 2013, has counted Nike as a member, has gained 5%, as the S&P 500 index has risen about 8%. The news generated plenty of online buzz, with social engagement around Nike and Kaepernick rising sharply this week, according to 4C Insights, a marketing technology company. Mentions of and comments about Nike on social-media platforms rose 1,678% on Sunday and Monday, according to 4C data. Mentions of Kaepernick spiked 362,280%, the data showed. The athlete has become the face of player protests against racial injustice and police brutality since he started sitting and later kneeling during the national anthem, inspiring others to follow suit. The action has irked President Donald Trump, who weighed in on the Nike campaign in a series of tweets this week, That didn’t deter Nike from airing its first TV ad of the campaign on Thursday. Narrated by Kaepernick, the ad includes appearances by other high-profile African-American athletes Odell Beckham Jr., LeBron James and Serena Williams. Nike’s most engaged audience persona is “Made it and Know it,” said 4C Chief Marketing Officer Aaron Goldman, one of 70 categories of consumers that 4C has identified by analyzing social-media engagement on a range of platforms. People in that bracket are generally successful in their careers and personal lives, are typically single with robust social lives, and like to spend money on entertainment and travel, as well as online streaming services. “Racial equality is a top concern for this audience, along with causes like clean-water access and gun control,” Goldman said. Daring to take a political stand has become a new paradigm for brands, as they seek to connect with a younger generation and changing political views, said Goldman. “A company like Procter & Gamble that makes products for everyone from young to old, male and female, are not going to do something controversial that might alienate half their audience. But a company like REI can take a stance on national parks, because they know that is really important for their customers.” The outdoor-pursuits retailer REI was one of the companies that hit back against Trump’s executive order late last year that would dramatically reduce the size of two national monuments in Utah. “The extensive roster of athletes and their powerful stories are core to the company’s stepped-up efforts in reaching a younger demographic,” Nagel wrote in a note earlier this week. The Kaepernick campaign “is clearly an effective way to make some noise in the industry, regardless of any political bent. " "Over time, for Nike, we think the power of the messaging from this new broader campaign is apt to overshadow any potential backlash, near term, in our view,” Nagel wrote. What Kaepernick and Nike don't seem to understand is that there are tens of millions of Americans who have a reverence and respect for the flag and anthem as symbols of their love of country. Kaepernick chose a form of protest that was meant to incite instead of trying to win people over to his point of view. Frank the Crank wrote: What Kaepernick and Nike don't seem to understand is that there are tens of millions of Americans who have a reverence and respect for the flag and anthem as symbols of their love of country. Kaepernick chose a form of protest that was meant to incite instead of trying to win people over to his point of view. Kaepernick is in thrall to his white hating SJW girlfriend. His purpose is to sow discord while he and every other race baiter ignore the real problems in the black community. He's a phony. Kaepernick, like every other race baiting demagogue ignores the real problems plaguing the black community choosing instead a course that will benefit Colin Kaepernick. He's a phony. Frank, if you never walked a mile in Kaepernick's shoes, don't question his motives. Maybe you don't like it, but Kaepernick's silent witness is constitutionally protected and harms no one. In fact it's the gentlest form of protest there is. Adopt a position of tolerance toward other people's testament regarding their own experience, and they will do the same for you. You're wrong Marie. There is no tolerance for dissent on the left. Disagreement with a woke progressive automatically makes you a racist. I find the focus on racism and police misconduct to be a smokescreen put up to avoid facing the real problems faced by the black community. Until black men start taking responsibility for their children and begin forming supportive families progress will be impossible. It's sad and just mentioning it, like the eulogist at Aretha Franklin's funeral, brings on immediate condemnation by the victim lobby. Kaepernick is a self serving enabler. Frank the Crank wrote: You're wrong Marie. There is no tolerance for dissent on the left. Disagreement with a woke progressive automatically makes you a racist. I find the focus on racism and police misconduct to be a smokescreen put up to avoid facing the real problems faced by the black community. . . . There's nothing the least bit original in anything you've said so far, Frank. We've already heard every single one of those talking points and they were getting pretty threadbare a couple of decades ago. This has not been a promising way to introduce yourself. May I offer a suggestion? Stick to stuff you've personally lived, and I promise you'll get a good reception around here. But no more talking points, please. And no more pretending to be directing your comments to me or another poster, when it's really only a pretext to recite boilerplate. Yeah I guess we should continue to whistle past the graveyard. I agree with Colin Kaepernick's cause, and admire his gumption, I just don't think that kneeling during the national anthem is the most effective form of civil disobedience. 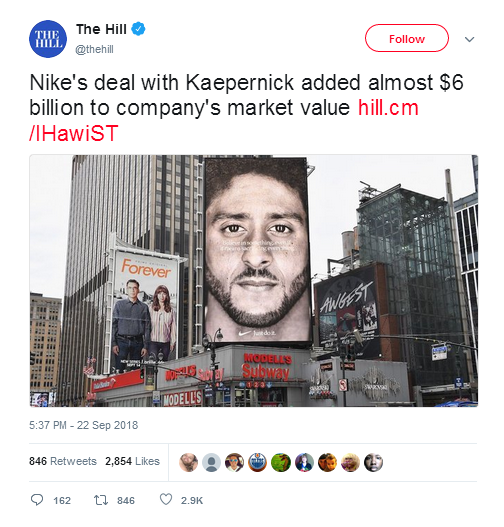 THISE WHO HAVE DECIDED to boycott Nike and its products after the company made free agent quarterback Colin Kaepernick the face of its Just Do It campaign are not going to like these numbers. Nike’s stocks closed at an all-time high on Thursday at a clip of $83.47 per share. This comes on the heels of online sales jumping 30 percent following the debut of Nike’s ad campaign focusing on the 30-year anniversary of Just Do It. 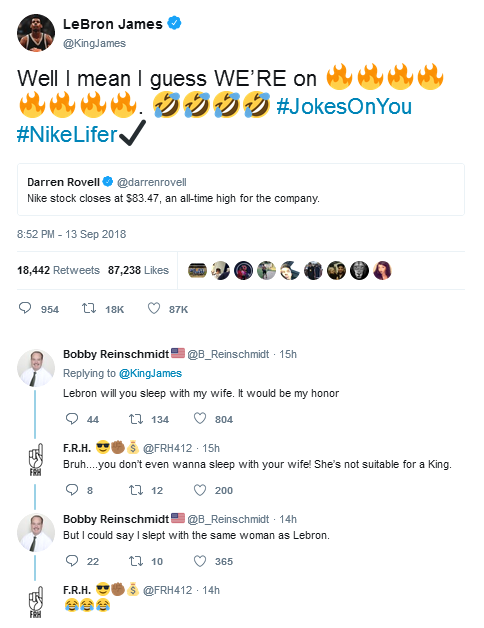 On the one hand, it’s interesting to see Nike’s product and sales being taken to a whole new level. On the other hand, those who are opposed to Kaepernick’s involvement in the campaign are not necessarily the company’s target consumer. That could be one of the reasons we’ve seen sales increase and Nike’s stocks take off -- which doesn’t make it any less intriguing. Holy crap!-- what was Nike thinking???! Must be all those deplorables buying shoes to burn. Slfriend79 wrote: Must be all those deplorables buying shoes to burn. 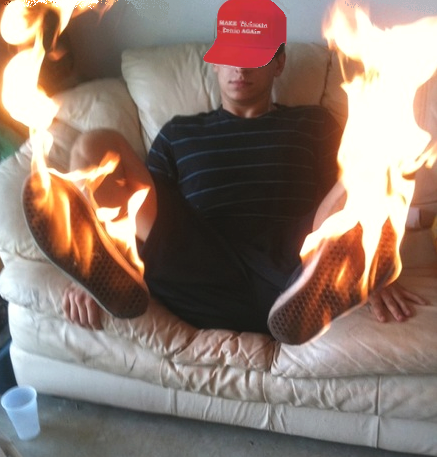 Hah, all those stupid Trumpers giving themselves the hotfoot! Can't imagine they're intelligent enough to take them off first.